In the four and a half years that I’ve had this blog, I’ve written over six hundred articles (and trust me, nobody is more stunned by that number than I am). Most are about sports, technology, music, movies, and my family, as well as the occasional article on things like religion and politics. None of them are as important as this one. If you are only a casual reader of this blog, regularly skipping articles about subjects that don’t interest you, I implore you to read this one to the end. I first met Cindy Marshall in 1994, when her sister Kerri married my friend (and best man at my wedding) Jeff. I don’t know a lot of my friends’ siblings, but Cindy and Kerri (and their parents) are very close, so you can’t know one without knowing the other. Cindy had her first child, Sarah, in February 1997, and Kerri had hers, Rachel, in June. But the fact that both children were girls and both were born in the same year is just about the extent of the similarities. Rachel’s most significant physical problem is that she needs glasses. Sarah, on the other hand, had surgery before she was born, has had a number of surgeries since then, and has been close to death more times than I care to remember. The fact that she is still alive has been called a miracle. Part-way through Cindy’s pregnancy, a routine ultrasound showed that the baby’s bladder was enlarged. Upon further examination, doctors discovered that it wasn’t draining properly, so she underwent two surgeries (called “bladder taps”) in-utero. At this point the doctors thought there was an obstruction of some kind and believed that it was a relatively mild problem. Sarah was born five weeks early on Valentine’s Day 1997, and weighed less than five pounds. She wasn’t yet two days old when she had her first major surgery, an attempt to repair her twisted bowel. Immediately following the surgery, her appendix ruptured and had to be removed – the first of a number of organs to be removed from Sarah’s tiny body. After three more surgeries in two months looking for bowel obstructions, Sarah was diagnosed with “megacystis microcolon intestinal hypoperistalsis syndrome“. In a nutshell, her bladder was enlarged, and her intestines were pretty much non-functional. Sarah spent the next five months at Sick Kids hospital in Toronto. She was started on TPN (Total Parenteral Nutrition), which means that she was fed completely intravenously. This is not a big deal for adults – many adults can live on TPN for years – but it’s very hard on an infant’s body. It kept Sarah alive, but at a price – within a couple of months, it destroyed both her liver and pancreas. She already needed a bowel transplant, but now she needed a new pancreas and liver as well. In May, Cindy was told that Sarah’s only hope was a multiple-organ transplant and she was placed on the transplant list. 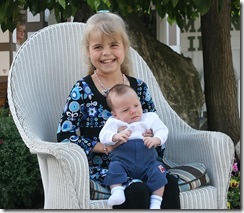 At that time, no child as young as Sarah had ever survived such a transplant. I don’t know if Cindy knew that then. Sarah’s life expectancy during this time varied, but was usually measured in months or even weeks, and at times much less. I remember being at a gathering at Jeff and Kerri’s house in Newmarket (for Jeff’s birthday, I believe) when the phone rang. The call was from Cindy at the hospital, basically saying “You better get down here now“, and Jeff and Kerri immediately grabbed their coats and left. I was standing right by the front door as they left, and as long as I live I will never forget the look on Kerri’s face. The party broke up shortly after they left as we all contemplated what was likely to happen that night. Thankfully, Sarah made it through that night and a number of others like that before something both terrible and wonderful happened – another infant died. I feel like a monster for even using the word “wonderful” in a sentence describing the most painful thing that could happen to a parent. But on what must have been the worst day of their lives, the parents of the child who lost his life (all Cindy knows about him is that he was a ten-pound baby boy) made a decision that saved Sarah’s – they agreed to allow their child’s organs to be harvested for transplant. Sarah was flown from Toronto to Children’s Hospital at the University of Western Ontario in London and at the age of 5 months 24 days, she received a new stomach, pancreas, liver, and bowel. In addition, both her gall bladder and spleen were removed. The date of the operation was August 7, 1997, a day that Sarah and her family and friends still celebrate as “Life Day”. The transplant saved Sarah’s life, but it hasn’t all been roses since then. She spent the next five months in the hospital in London before finally coming home for the first time at the age of ten months, and to this day returns to the hospital regularly for treatment and checkups. Transplants are funny – the body can live with a transplanted organ for years, even decades, and then suddenly decide that it’s a foreign body and needs to get rid of it. As a result, Sarah has to take several different kinds of medication every day to avoid rejection, and will for the rest of her life. The medication has serious side-effects as well. She never crawled as a baby because she simply didn’t have the strength and needed help on stairs until the age of four or five. Sarah is a full foot shorter than her cousin Rachel (who is younger by four months), and despite being twelve years old, she weighs less than 60 pounds. She has very thin arms and legs with little muscle. She loves to dance and has been taking dance classes for years, partially because she enjoys it and partially to help her build up her strength. Not only did the operation save Sarah’s life, but it was special in a number of other ways as well – it was the first pediatric multi-organ transplant in Canada, and only the second ever with those four organs. Sarah became the youngest multi-organ transplant recipient in history, and has a certificate from the Guinness World Record people to prove it. Despite all the hardships she’s had to deal with, the surgeries, the medication, the procedures she still has to have done every day, all the trips to the hospital in London (did I mention that she lives in Cobourg, about 300km away from London? 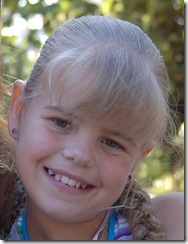 ), Sarah remains a happy, bubbly, delightful little girl. She doesn’t have the physical strength to do things that other kids do, even some much younger than her, but I have never once heard her complain about it. Now don’t get me wrong, she gets grumpy now and again like any other kid. And Cindy has probably heard her complain on numerous occasions, but note that I said “I’ve never heard her complain”. Seriously though, Sarah is almost always smiling, she loves having her picture taken, she adores her baby brother Austin, and she’s just always fun to be around. She’s spoken at public events about her experiences, and has been interviewed for a number of magazines. You may remember a Wal-Mart TV commercial a couple of years ago, where a number of people said “I was one”, “one” being a child whose life was saved at children’s hospitals. The little girl at the end who whispered “I am one” was Sarah. Like all of my friends who know Sarah, Gail and I have signed our organ donor cards and quite honestly, other than having religious beliefs prohibiting it, I cannot think of one compelling reason not to. If Sarah had not had her transplant, she would almost certainly have died within a year of her birth, and those of us who have gotten to know and love her over the last twelve years would have been deprived of that. I signed my donor card so that I might be able to help others have a similar experience. Please sign yours. This entry was posted in Kids, Misc on October 5, 2009 by Graeme.